If you put “investigative journalism + China” in Google search bar, you will probably be disappointed with the few results it returns. There is a book about it <Investigative Journalism in China: Eight Cases in Chinese Watchdog Journalism>, which I read a few years ago and would still recommend. For the English-reading world, there is really limited information about this important topic. Even if your Chinese is good enough to perform a search, you will again be surprised about how few relevant results you can get. It’s not an indication that investigative journalism is dead in China. Though it is indeed declining – check out an article I wrote for IJNet back in 2011 – China’s next brain drain: investigative journalists, or a more recent one on the same issue in 2013 –中国第一代调查记者“触顶”转型. My friends who used to work as investigative journalists in China have been flocking to other industries – many started their own business (check out this recent articles in Chinese 亚洲周刊｜胡泳：新媒體創業風起雲湧爭奪話語權, published earlier this year), some turn to non-profit (Deng Fei for example), and some just retired to open their guesthouses and enjoy life. However, for those who stay and continue to fight, China remains a gold mine for investigative stories, with lots of pressing issues – environmental crisis, government/Party corruption, judicial injustice, public health, money laundering (case of Bank of China and case of UnionPay ), among others. Yet, new technologies and powerful social media are providing new opportunities and helping stories reach broader audience and win greater social impact. The film, entitled <Under the Dome>, went viral since it launched on March 1, 2015. Within 3 days, it reached 200 million hits. It is a TED-style talk, mixed with traditional TV interviews with credible sources, international reporting (she went to UK and US to learn experiences and practices from London and Los Angeles), drone shooting the factories (though failed because the pollution was too serious), data and charts as an effort to make sense of the abstract numbers, social network visualization of the corruptions within the environment and energy power system, and even animation to illustrate how PM2.5, a harmful micro-particle in pollutants, can invade human bodies and cause irreversible harm. It is not perfect – lots of public debates are around the way it tells the story and the facts and data, but it successfully leveraged all the technologies and presentation formats that is available now and made the film really powerful. Another example is a series of stories around Zhou Yongkang, the most senior Party official caught in the anti-corruption campaign last year. Carried out by a 9-person team at Caixin, one of the most reputable media organization in China, the investigation took 1 year and a 60,000-word piece was delivered, some of which are translated into English. It is solid reporting, but how many people would still sit down and read through the 60K words? 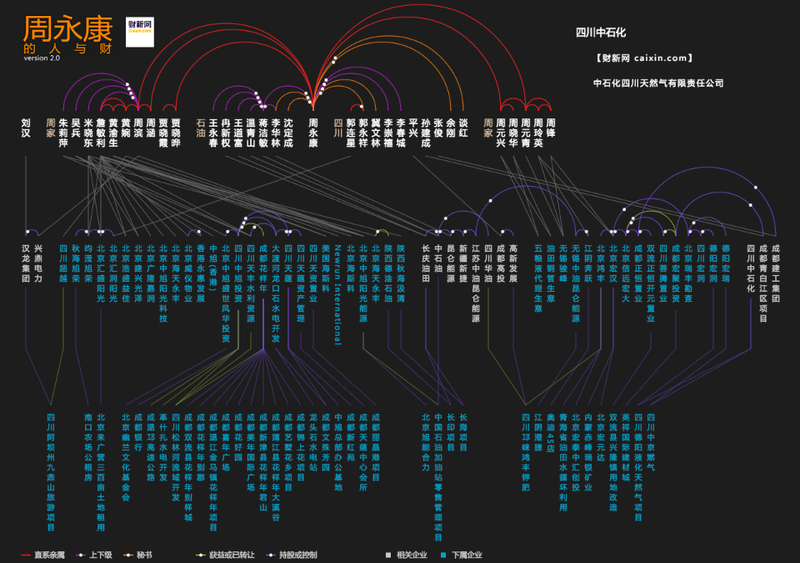 So Caixin’s Data Visualization Lab produced an interactive visualization to illustrate the people and companies connected with Zhou – English version here, note it’s designed differently from the Chinese version below. This project received 4 million hits, according to Huang Zhimin, the CTO of Caixin and the head of the Data Visualization Lab. In some other cases, investigations are not done by professional journalists or media organizations, but ordinary citizens. Interestingly, you don’t hear the term “citizen journalism” in China now, at least not as much as you would a few years ago. But that doesn’t mean that’s dead. Quite the opposite – with the popularity of social media, everyone provides information and the pieces would quickly come together. A well-known example is the “watch brother“, a local official whose photos of wearing luxury watches were spotted by social media detectives and all the brands (Bulgari, Omega and Rolex, to name a few) and even some of the models were identified. He was later investigated and sent to jail for 14 years. <Under the Dome> was taken down from Chinese video platforms after surviving online for only 7 days. 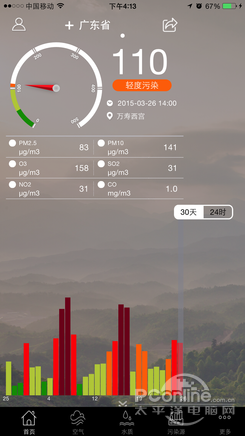 However, an app about pollution that was mentioned in the documentary hit top 1 in the app store and reached 3 million users. 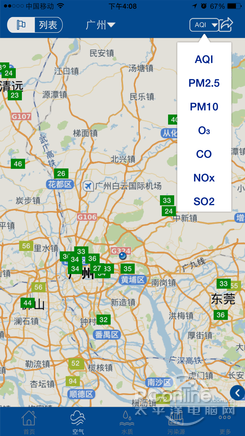 It does not only take data from the Ministry of Environment and make them more readable, but also has a crowdsourcing function where users can report factories that are disposing pollutants. Within March, over 300 factories were reported and had to rectify. Changes are happening, with the help of more open data and better presentations. There are still lots of challenges and risks for doing investigative journalism in China. Censorship is exercised online and offline. Surveillance is by default, internal and external. Media institutions are declining, same as everywhere else in the world. But despite of all the difficulties, continuous efforts are being made – always as a collaboration between media organizations, civil society, and individual citizens, and it’s important to keep it going.